On this day, February 12 1554, Lady Jane Grey, famously the Nine - or more accurately, Thirteen - Day Queen was beheaded privately on Tower Green, shortly after her teenage husband Guildford Dudley had been executed on Tower Hill. Last week I detailed the execution of Mary Queen of Scots, Jane's fellow queen who, like Jane, believed that she was dying as a martyr for her faith. Unlike Mary, however, Jane was dying as a fervent, even devout Protestant, and has ever since been mourned as a martyr for the Protestant faith and a victim of the Catholic queen Mary Tudor's bloody campaign of tyranny. Lady Jane had been born sometime between the autumn of 1536 and the autumn of 1537 to two highly ambitious Tudor figures, Henry Grey, marquis of Dorset, and his notorious wife Frances Brandon, who was the daughter of Henry VIII's youngest sister Mary by her husband Charles Brandon, duke of Suffolk. Royal blood thus flowed in Frances' descendants. Jane's sisters, Katherine and Mary, were born in 1540 and 1545 respectively. Jane's childhood and the nature of her relationship with her parents is something of a mystery. The Victorian era, through portraying Jane as an innocent teenage victim and Protestant martyr, depicted Jane as ruthlessly bullied by her cruel parents, especially her tyrannical mother, apparently famously beating her when Jane refused to marry Guildford in 1553. This portrayal of the Grey parents' relations with their eldest daughter was famously described in Alison Weir's fictional historical novel Innocent Traitor, where Frances mercilessly punishes her daughter, often physically beating her and inflicting violence on her. Recent historians, however, have questioned the reality of the personal nature of the Grey family's relations with one another. Plowden, for instance, suggests that Jane's complaints about her parents' harsh treatment of her may not necessarily reflect reality but, instead, 'may... illustrate the attitude of a priggish, opinionated teenager, openly scornful of her parents' conventional, old-fashioned tastes'. Whatever the case is, Jane was, famously, extremely intellectual. In the words of Alison Plowden, who has written extensively on her, she showed 'exceptional academic ability'. Aged thirteen, she was found by Roger Ascham, Princess Elizabeth's tutor, to be reading Plato, and she was learned in several languages, classics, history, religion/theology, and sciences. In the spring of 1547, aged around ten, Jane was sent into the household of Henry VIII's last and ultimately luckiest queen, Katherine Parr, who quickly showed fondness for her young charge. Jane was exposed to Katherine's radical Protestantism, and she later shared lessons with her royal cousins Edward and Elizabeth. It has been theorised by numerous scholars that these three developed a strong Protestant faith which they all shared equally passionately, although it seems unlikely, given what we know of her reign and personal beliefs, that Elizabeth was as puritanical in her Protestant religion as Edward and Jane were. Tragically, Katherine died in childbed in 1548, and Jane returned to her parents' home in Leicestershire. Jane rapidly became an increasingly devout Protestant, and as a teenager she began, with her tutors' encouragement, to communicate with radicals on the continent, including Heinrich Bullinger, associated with the radical church in Zurich. By now, of course, Jane's teenage cousin Edward had become king of England, and Protestantism had been forcefully introduced into England through a swift and brutal campaign of destruction of all traces of late medieval Catholic religion. In 1551, aged fourteen, Jane began to attend court more, following her father's advancement through becoming Duke of Suffolk, a wealthy and prestigious title which further enhanced the status of the Grey family. Jane apparently came into conflict with her thirty-five year old cousin Princess Mary, since Jane, despite only being in her early teens, showed considerable distaste towards her cousin on account of her Catholic religion. When Mary kindly sent her a lavish and fashionable dress, Jane rejected it, viewing it as symbolic of the corrupt nature of Catholicism. She pointedly remarked that it was a shame that Mary did not dress like her sister Elizabeth who, in the true spirit of Protestantism, rejected lavish dress and instead wore plain, modest clothing. What is clear is that during the early 1550s Jane, and her family, became increasingly important at court. There had even been talk that Jane would marry her cousin Edward and become queen, thus further strengthening the Protestant religion in a gradually radical England. In 1553, it was arranged between the Grey parents and John Dudley, earl of Northumberland, that sixteen-year old Jane would marry Guildford Dudley, a younger son of Northumberland. Famously, Jane refused, and the story goes that her parents beat her mercilessly until she agreed to marry him, although it is uncertain whether this in fact happened. The marriage occurred in May, on a day when three weddings occurred at Durham House in London. Jane's thirteen year old sister Katherine was also married. Dramatic developments entailed in July when the fifteen-year old king Edward tragically died. Of course, this signalled Jane's fantastic rise to power and, eventually, triggered her dramatic downfall. Historians have debated intensely the processes which led to Jane becoming queen of England, with some arguing that it was a Grey-Dudley family plot which saw members of that family, prominently the duke, bullying the king into naming Jane as his successor. Others have doubted this and emphasised that it was the king's intention all along to pass the crown to Jane, to ensure the triumph of Protestantism in England. Even though his own sister Elizabeth was Protestant, both she and Mary were excluded from the throne on account of their status as bastards. According to Jane's later letter to Mary, she was 'stupefied and troubled' by the astonishing announcement in early July that she was now Queen of England, but accepted the throne as a means of inaugurating Protestantism further in England. This has been explored in fictional works such as the 1985 film starring Helena Bonham Carter, Lady Jane, where Jane, as a devout Protestant, accepts the crown due to her religious beliefs. On 10 July, Jane was taken to the Tower; on the way, an Italian spectator watched the grand procession and described the teenage Queen as being red-haired, freckled, and very short and thin. Apparently, she was so tiny that she had to wear high platforms on her shoes. Her husband, Guildford, was described as being blonde, tall, and strong. According to contemporary accounts, the new Queen was received with largely indifference, confusion, and even hostility. Very few people had actually heard of Jane, and of course her cousin Mary was highly popular in England. Jane was proclaimed queen at Cheapside, before news quickly emerged that Mary had assembled an army and was intending to march into London and recover her throne. Jane's Council fell apart, with Northumberland unable to defeat Mary, and Mary was soon afterwards proclaimed queen. Jane's father ripped up her canopy of state when he later met with her, and informed her that she was no longer Queen. Her reign had lasted thirteen days, from 6 to 19 July. To begin with, Mary had promised to be merciful, and it does seem likely that, as a kind-hearted but ultimately inexperienced and naive woman, she intended initially to spare her seventeen-year old cousin, who she believed had not wanted the throne for herself, and was merely a pawn of her ambitious family. Northumberland, however, was executed in August 1553, despite his earnest attempts to save himself through converting to Catholicism shortly before his execution, to no avail. Jane allegedly voiced shock and contempt at her father-in-law's renouncing of his religious beliefs. In November, Jane and her husband were tried for treason, and were condemned to die. Jane's fate was to be beheaded on the Green or to be burned alive within the Tower. She was assured, however, that she would not die, and that Mary would save her. Tragically, Wyatt's rebellion in early 1554 sealed Jane's fate. Up till then, the queen had granted her several freedoms, allowing her to continue studying and to walk in the Tower gardens, and Jane had had nothing to do with the Wyatt rebellion. Yet this confirmed to both Queen Mary and her Council that she would never be truly safe until her cousin was dead, since she would always be the figurehead for strong Protestant plots who sought to remove Mary and replace her with a Protestant monarch. The Queen was no longer able to be merciful, and Jane's execution was scheduled for February. Again showing her merciful nature, Mary sent the new dean of St Paul's to attempt to convert Jane, who Mary viewed as a heretic on account of her Protestant faith and hostility towards Catholicism, but to no avail. Demonstrating remarkable bravery and single-mindedness, bearing in mind her tender years, Jane refused to renounce her faith. On 12 February, both Jane and her husband Guildford were beheaded. Guildford was executed first, although Jane refused to bid goodbye to him. Jane apparently cried "Oh Guildford!" when Guildford's bloody body was brought by her window, before processing to Tower Green for her own execution shortly after 10am. Dressed in deep black, and described by the onlooker Richard Grafton as being "a gentle young Ladie with singuler gifts both of learning and knowledge", Jane made a short speech on the scaffold, admitting that she had done wrong in accepting the crown, but emphasising her innocency and love of God. She announced that she died as "a true christian woman", before kneeling down and saying Psalm 51. The headsman stepped forward and Jane, finally, saw the dreaded block for the first time. Unlike Anne Boleyn, she was executed with an axe by kneeling before the block. Following her ladies tying a kerchief around her eyes, Jane experienced a brief moment of panic and distress, groping for the block and crying out, "Where is it? What shall I do?" before someone came forward to guide her. The execution was soon over quickly, and Jane's body was buried in the chapel of St Peter ad Vincula, along with her fellow queens Anne and Katherine, who had been buried there previously. The execution of Lady Jane Grey has since given rise to a legend and a series of myths surrounding this unfortunate young woman. Plowden referred to her beheading as "the judicial murder... and no one ever pretended it was anything else". Yet Plowden also, wisely, cautions that "it is difficult now to see beyond the religious bias of such contemporary sources as Holinshed's Chronicles and Foxe's Acts and Monuments, or the uncritical later biographies of Agnes Strickland and Richard Davey." She was made an icon as a Protestant symbol, an innocent victim of the bloody and cruel Catholic Mary I, who was vilified and condemned as evil and corrupt in Protestant sources of the kind produced by Foxe. The painting above, painted in the nineteenth century by a French painter, helped to promote the image of Jane as a guiltless, gentle teenage martyr, characterising her as a Protestant heroine, even a saint. The famous Tudor historian Eric Ives, who wrote a celebrated book about Jane, concluded in his study of the young Queen's life that "Truth to tell she counted for little. She was important for barely nine months, she ruled for only thirteen days... And yet her name still lives... But the fundamental justification for remembering Jane is the justification for remembering Anne Frank centuries later. They speak for the multitude of brutality's victims who have no voice". As beautiful as this is, I also agree with Plowden, who wrote somewhat unsettlingly: "...the reality of Jane Grey, sacrificial victim of realpolitik though she undoubtedly became, was surely rather more disturbing than the sentimental myths surrounding her seem to suggest". I agree. The picture we have of Jane, and the depiction of Queen Mary I, are the results of the triumph of Protestantism, and later secularism, in England today, thus identifying the Protestant Jane as a victim and martyr for England's faith and her cousin as alien, barbaric, cruel, un-English, unnatural. Imagine if Catholicism had triumphed, and Mary was celebrated as a good and highly effective ruler and Jane as a traitor. Historians need to remember that the pictures we have of historical figures are often influenced overwhelmingly by later national, political, and cultural developments. Thus the success of the Reformation in England has led to Anne Boleyn being celebrated as an important religious figure in her own right, rather than as a royal prostitute as she was identified in her own time, while the success of Elizabethan Protestantism has similarly led to harsh judgements about one of its victims, Mary Queen of Scots. 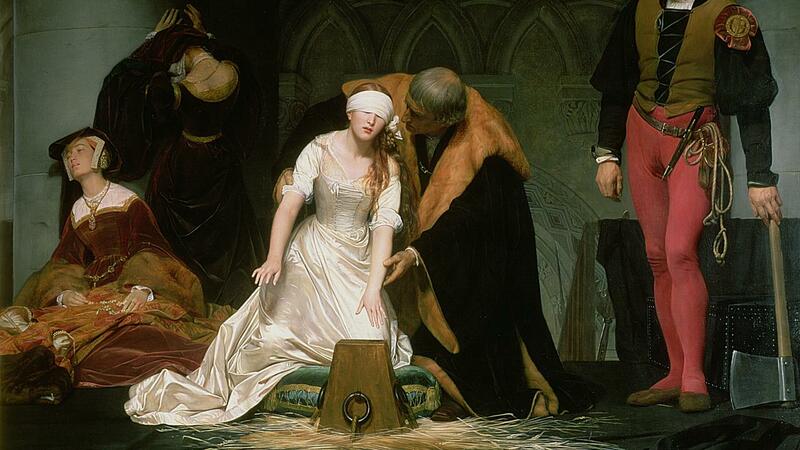 Truth be told, Jane Grey must be seen as a tragic and unfortunate figure. She was beheaded at the age of seventeen, in a highly cruel time which experienced bloodshed and political rivalry on a constant basis. But Jane held firm religious beliefs, she was highly confident that she would enjoy salvation, and I doubt very much that she saw her cousin Mary with anything but contempt and pity, perhaps. She was innocent in that she did not readily participate in family plots to seize the throne, but I do think Jane was more complex than Victorian writers made her out to be. There is evidence to suggest that she was stubborn, highly opinionated, ruthless, priggish, and very narrow-minded towards those who did not share her beliefs. Who knows - if she had defeated Mary, and continued as Queen Jane, there may have been a persecution of Catholics on the same scale as Queen Mary persecuted Protestant heretics. Homosexuality in England - Hatred, Hidden, Hope?